Saheli Outreach is, as the name suggests, the part of Saheli which proactively reaches out to women and girls. The aim of the Outreach is to inform everyone about the activities of Saheli especially those centered around protection against Domestic violence and child abuse. 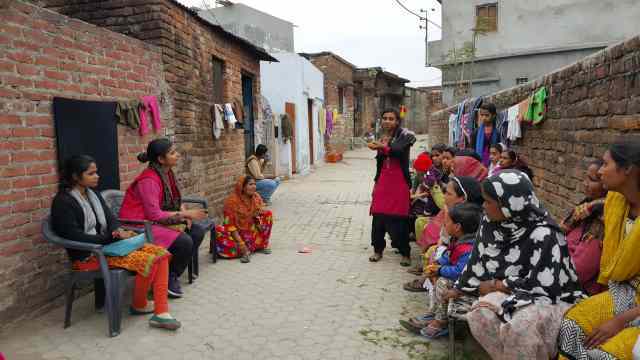 Under the program, monthly meetings are held in various villages around Dehradun and slum clusters and all the participants are given a card with the Saheli Helpline number written on it. It is during the outreach programs that we meet a significant number of women requiring help. In 2018, we had visited 3995 homes in 132 different villages / urban slums and have held 23 community meetings which were attened by 326 women. The program is headed by Ms Kanti Rawat, our Outreach Manager and has a number of outreach workers.